¿Cómo habitar las tramas de las prácticas performáticas una vez finalizadas? En diálogo con artistas del Antihomenaje Dadá, se diseña un recorrido de lectura de las performances realizadas como modo de restituir aquel acontecimiento efímero y escurridizo. A su vez, experimentando un ejercicio de recepción lúdica, se invita al público a emplear técnicas de creación de los movimientos de vanguardia –como el cadáver exquisito, la escritura automática, el collage, entre otras- para re-inventar, a través de imágenes y enunciados desarticulados, la interpretación del diálogo acaecido. Type of activity: Public presentation. Dialogue. Not to be archived. To be published. 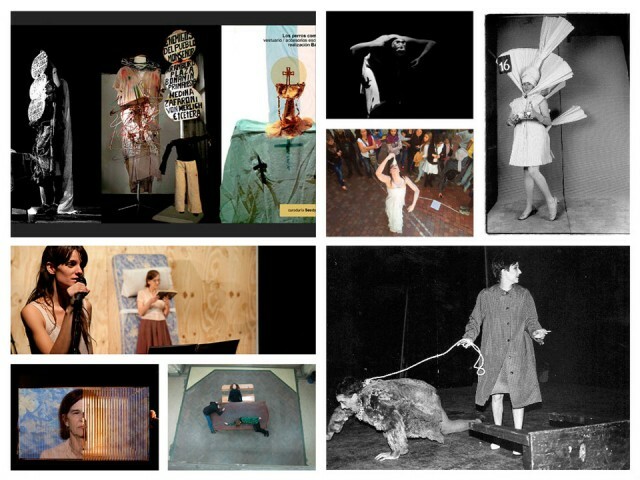 Series of projections of performatic theater from the 80s. In the cultural arena of the 80s, a freedom-seeking youth conceived affective and creative complicities that disrupted traditional forms of representation, codes and conventions, not only artistic but also social. No se archive (Not to be archived). Publíquese (To be published) features the remains of those practices with a selection of the Batato Barea Archive (Seedy González Paz). The figure of Barea brings together a constellation of artists that develop Performatic Theater in a way that can design a poetic machinery, the workings of which still shapes the scene in the city of Buenos Aires. The first screening will be Buenos Aires alternativo (Mignona, 1996. TV Documentary. Channel 7, ATC). During the second encounter, Esta me la vas a pagar (El Clú del Claun, 1987. Centro Parakultural). The third one will feature Alfonsina y el Mal. Homenaje a A. Storni (Batato Barea, 1990). In the fourth and last one, Todo menos natural (Round table, 1991, Instituto de Cooperación Iberoamericana de Buenos Aires). Type of activity: Conversation with the audience. Projection series. The philosophy of theater and its comparative history suggest two theoretical notions: ''matrix-theater'' and ''theatrical liminality''. They are presented as tools for a research program on the history of theater throughout the centuries. This shines a light on the action of historical avant-garde movements for their work on liminality and theoretical reflection upon liminal phenomenons in art, as well as post-avantgarde. The concept of ''liminal theater'' allows us to think of history form avant-garde to the theatrical future and past. Type of activity: Conversation with the audience. Conference. Between flesh and ink. The place for reflective-corporeal experiences in knowledge production processes. Research team of the Instituto de Artes del Espectáculo (IAE). Dra. Patricia Aschieri. Different voices have begun to question the radical division between theory and practice, body and thought, lived experience and the resulting narrations. The figure of the artist/researcher synthesizes the particular situation of those who study with/from the movement it involves, paraphrasing Michel Foucault, a game of replacement from one theoretical or practical topic to another. This conference will address the methodological and theoretical aspects of production conditions of the information of a unique experience in a critical way. The experience is called reflective-corporeal. Jorge A. Dubatti, 1963, Buenos Aires. Resides in Buenos Aires. He holds a PhD in Art History and Theory and works as a professor in the Arts Department. He is the current director of the IAE. He coordinates the Arts Sciences Research Department (AICA) at the Centro Cultural de la Cooperación. He founded the Escuela de Espectadores de Buenos Aires. His work has been distinguished with numerous prizes and special mentions. Patricia Aschieri, 1964, Buenos Aires. Resides in Buenos Aires. PhD in Anthropology, Professor at the Arts Department, Coordinator of the Liminal Arts Research Department (IAE). Co-coordinator of the Anthropology of the Body and Performance Team (ICA). FFyL-UBA. Professor and Researcher at UNTREF. She is a performer and director of the Grupo Ouroboros, Teatro Butoh. Guillermina Bevacqua, 1983, Entre Ríos. Resides in Buenos Aires. She holds a Masters in Combined Arts, a PhD in History and Theory of the Arts (FFyL - UBA) and is a fellow at CONICET. She develops her research work at the Instituto de Teoría e Historia “Julio E. Payró” and coordinates the Performance Arts Research Department (IAE). She is a member of the group ''Micropolíticas de la desobediencia sexual en el arte'' (LabIAL - FBA - UNLP). Coproduction: Universidad de Buenos Aires – Facultad de Filosofía y Letras.